i love the thought of you putting together your mama nest. luc's nursery pretty much just ended up being a place we "visited" every once in awhile... but oh! was it adorable. oh those bibs are really cute! 30 weeks! you're really getting close! do you know is it a boy or a girl? or are you keeping it a surprise? i'm 16 weeks and hoping to feel movement, soon, so i will 'know' the baby's there and well... isn't it all so exciting! the bibs are lovely, I like the way your pink bib is not too girly! happy nesting, not long to go now! 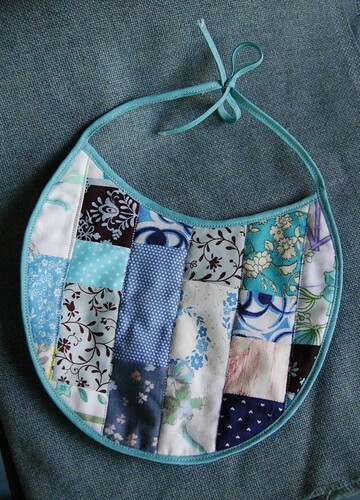 You have such flair with putting fabrics together, there's always something new for the eye to linger on. Beautiful. Not long, but still long enough to feel like you have time up your sleeve! In my experience the final two weeks always feels like ten, so relax, you have plenty of time. Yay not long to go now! I agree with Suse on the plenty of time approach - however I was caught by surprise 4 weeks early so um er yeah. Make hay while the sun shines and you have all that nesting stuff going on too. 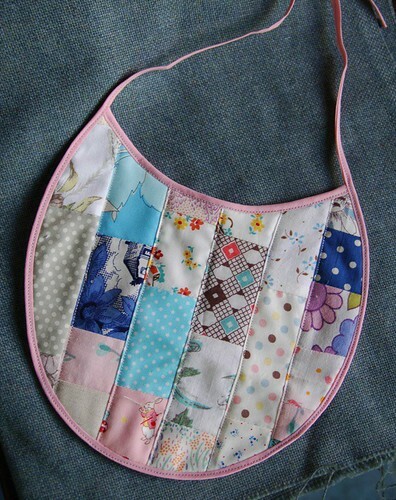 I love the little bibs, very stylish! These are wonderful! You have a terrific eye for combining patterns -- love 'em! Your little one will be very stylish indeed. Hang in there... I remember the last 10 weeks being the hardest, mostly in terms of sleeping (or lack thereof). Goodness, only 10 weeks left?? Love those bibs! What gorgeous bibs. You do such a nice job.